It is rare to find a group of elderly women, majority of them grandmothers with grey hair, some supported to walk by friends or walking sticks, gathered to dine and wine as they catch up on old school times. This was the rare occasion at Mrs Joyce Mpanga’s home in Lungujja, a Kampala suburb. 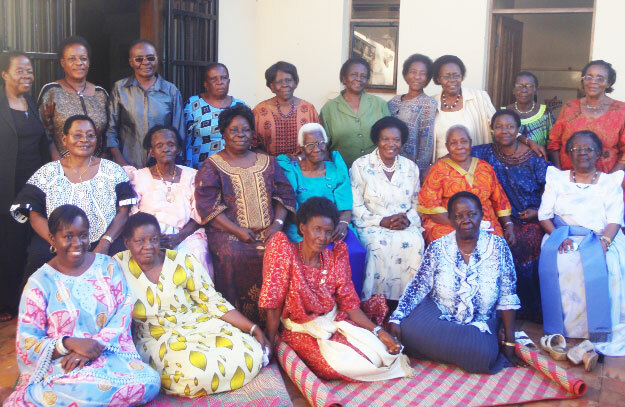 On a Sunday afternoon, several old girls of Gayaza High School gathered to celebrate the life of a 90-year-old woman who had greatly impacted their lives. For ‘new age’ old girls of the school, this might be a surprise that they were not invited to such an event. Well, you must have studied at the school during the colonial times or the early post-independence period to have been in the know of the function. In fact, it was hard to come across an old girl below 50 at the banquet. The old girls, from all walks of life, some chauffeured in expensive cars, gathered to celebrate the life of Gladys Vera Nansubuga Stokes, Gayaza’s former teacher of Home Economics and Nutrition between 1942 and 1962. Mrs Stokes, as she is commonly known among her peers, is perhaps the only surviving black teacher of the pioneer lot of African teachers at Gayaza High School, Uganda’s oldest girls’ school, founded in 1905 by Christian missionaries. She taught the first Gayaza A-level class that produced the maiden group that joined Makerere University on direct entry, following the phasing-out of the two-years intermediate course at Uganda’s oldest university. Previously, students entered the only university at the time after the Cambridge School Certificate (an equivalent of senior four) and they were required to sit for intermediate exams to assess if they were fit for a degree course. This pioneer class included ‘girls’ such as Mrs Joyce Mpanga, who ended up being the first Ugandan woman to graduate with a master’s degree. At the time, she was known as Joyce Masembe. Others included: Mrs Mary Barlow, who was at the time known as Mary Lukiza; Mrs Adelina Lubogo, who was formerly Adelina Kawesa; Mrs Norah Matovu, who then Norah Mugalu; Ms Sarah Magala and Ms Phoebe Mukasa, among others. Mary Barlow, who joined Gayaza in 1949 after her primary at Ndejje Junior School, recalls Mrs Stokes as an inspirational woman. “She taught us how to smear a house [floor] with cow dung,” a grey haired Barlow says. She recalls that there was a chapel adjacent to the headmistress’ current residence, which the girls occasionally smeared with cow dung. Back in the day, cows’ waste was the equivalent of cement and gave floors a smooth look, in addition to the bonus function of killing jiggers. Nnalongo Simwogerere, a farmer and resident of Luwero who joined Gayaza in 1958, says it was such a privilege going through Mrs Stokes’ hands. “When I look back, I am grateful for what she did in my life. She trained me into an accomplished wife and mother,” Simwogerere says. Hailing from a humble background, Simwogerere, who was taken on a motorcycle from Kampala to Gayaza, remembers crying all the way to the school, located 17km from Kampala. She had performed excellently and secured a scholarship from King George, but her worry was that she was not fit for Gayaza, which at the time was a preserve for daughters of chiefs. But today, She says she would have missed a lot had she not gone through Gayaza. This is because of the foundation on which the school was built. There was emphasis on Domestic Science, a subject that equipped girls with skills in domestic affairs, such as baking, cooking and tailoring. All the old girls, while not professional tailors today, remember something called “danning”, a sewing skill that was passed onto them by Mrs Stokes. It is because of the nature of the curriculum back then that most educated women aged 60 and above have excellent tailoring skills. Also, as today’s school girl packs toilet paper and textbooks at the start of a new term, back then, each Gayaza girl was expected to carry along a peeling knife. Mrs Victoria Sserunjogi (at the time Victoria Kisosonkole) who joined the school in 1951 remembers acquiring skills in making shoe polish from the Kabaka Anjagala tree seeds. “We would crush the seeds, dry them and make shoe polish out of them,” she recalls. The girls also learnt home nursing, where they were equipped with basic, but vital, skills of caring for a patient at home, for example, bathing a patient on a bed without wetting the sheets. Mrs Adelina Lubogo (then Adelina Kawesa) who joined the school in 1949 says there is a difference when you visit a Gayaza girl’s home and the homes of girls who went to other schools. The gist of the difference, according to Lubogo, is in the beauty of training girls into better wives. She recalls a school programme that was called Mother Crafts, where the school brought in newborns from Sanyu Babies Home, put them in a nursery section and each girl was expected to spend two weeks with the baby. “You would be allowed to leave class to go check on ‘your’ baby,” Lubogo recalls. This, she says, prepared them for motherhood. “I am surprised when I see girls today finishing senior six and they don’t know how to sew,” Lubogo says. Under the guidance of Mrs Stokes, the girls had to learn basic domestic chores such as tailoring and baking biscuits. On March 26, Mrs Stokes turned 90 and was on May 22 treated to a special birthday party at UMA show grounds, attracting bigwigs such as businessman James Mulwana. Mrs Stokes, herself a former student of Gayaza High School, is a trained teacher with a diploma in education from the Institute of Education, University of Bristol. Wearing a light blue busuuti, a Ganda traditional dress whose origin is also traced back to Gayaza High School, Mrs Stokes arrived at Joyce Mpanga’s home in an Ipsum and almost broke down with emotion on seeing these ‘girls’ she once educated, all of them now highly respected Ugandans. Some had travelled from abroad just to attend the banquet in her honour, and were scheduled to fly out of the country that evening. Clasping her hands together, she humbly bowed her head and then shook hands and hugged her former students who had lined up to welcome her. She was treated to a special birthday moment, where she cut a cake and her girls gave her a food steamer in honour of her way of life as a person who never eats fried foods – she only eats steamed food. Mrs Stokes, who has no children, was married to Charles Stokes, who died some time back. She now lives in a plush bungalow atop Bunga Hill. 1942: Became a house mistress at Gayaza, as well as teacher in junior secondary. 1953-54: Acting headmistress of the primary section. 1954: Got a government scholarship to the teachers’ training college of domestic science in Bath, UK. Also studied Tropical Nutrition in the London School of Hygiene. After UK stint, went back to Gayaza to take active role in farm diets scheme and teaching nutrition and other domestic science subjects. 1963: The Food and Agriculture Organisation (FAO) of the United Nations sponsored her to return to Bath to complete a three-years course for a certificate of education, University of Bristol. On return, became Senior Nutrition Supervisor for Mulago Hospital's Paediatrics department’s Freedom From Hunger Campaign and Nutrition Rehabilitation project (Mwana Mugimu) where she worked for 20 years. She came up with a curriculum which is used up to date on nutrition. 1983: Rotary Club of Kampala recognized her for her contribution to society. 2005: Received an award from Gayaza High School for her contribution to girl child education.